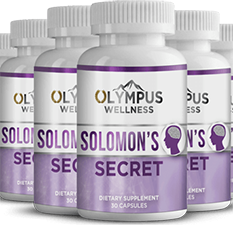 Today we’re going to review the Solomon’s Secret supplement by Olympus Wellness. 2. A detailed review that will explain everything you must know about this supplement before making your final decision. Designed by Glenn, a Biblical Historian, and an archeologist, the “Solomon’s Secret” is a dietary supplement containing 6 powerful ingredients that will enhance your memory with just one capsule per day. According to his story, he and his research partner, Joseph, excavated a small room that has jars containing hyssop (Bacopa monnieri) in a remote corner of Israel. This herb is supposedly mentioned in the Bible, particularly in 1 Kings. So, what’s so great about hyssop? Studies have shown that it can markedly improve our memory and brain performance. It may also help alleviate depression due to its calming properties. Phosphatidylserine (PS) is another ingredient found in this supplement. This amino acid is typically found in chickens, cows, and mullet fish. Research suggests that PS is vital for brain health because it reduces the risk of dementia and cognitive dysfunction among elderly people. Next is Rhodiola rosea, also called as Golden Root and King’s Crown. Taking this herb regularly will ease exhaustion and can boost your short-term memory, concentration, ability to mentally calculate, and audio-visual perception. To make this supplement, Glenn teamed up with Olympus Wellness, which is supposedly a US-based Christian supplement company. Aside from the three ingredients we mentioned, they also added gingko biloba leaf extract, Ultra-Pure B12, and DMAE (dimethylaminoethanol) to increase the effectiveness of this dietary supplement. What can these ingredients do for you? This is just a summary of the main ingredients of the “Solomon’s Secret.” For more information about these ingredients and the way this supplement works, please click here. It’s not hard to find scientific studies about the ingredients used for making this supplement. Results are quite mixed. Some say they don’t work, while others confirm the benefits claimed by Glenn. According to WebMD.com, Brahmi (also called Bacopa monnieri and water hyssop) might protect the brain from Alzheimer’s disease, memory problems, stress, and anxiety. Preliminary studies suggest that plant-derived phosphatidylserine may improve behaviors and the brain’s ability to solve problems, learn, pay attention, and remember. It’s not only your brain that’s going to benefit from these health-promoting herbs. Bacopa monnieri (Brahmi) supports proper liver function, protects newborn infants against hypoglycemia-induced brain damage, reduces redness and swelling, promotes normal blood pressure, and protects organs from the damaging effects of opioids. Meanwhile, Rhodiola rosea can boost your mental capacity, energy, strength, and stamina. Phosphatidylserine can improve your athletic performance, treat symptoms of ADHD and Parkinson’s disease, and fights depression. We’re not saying that it’s guaranteed not to cause any side effects. Some people will most likely develop negative reactions to some of its ingredients. However, so far, there have been no severe side effects reported because of taking the Solomon’s Secret Supplement. Preliminary studies and medical articles published online suggest that these ingredients (Bacopa monnieri, Rhodiola rosea, and phosphatidylserine) might have the potential to treat memory-related diseases and support brain health, among others. It’s good to know that scientists have already investigated these traditional medicinal herbs and acknowledged that they might be beneficial for your brain and overall health. Although large, peer-reviewed studies are still needed. If you don’t see improvements in your memory or brain performance, you can request for a full refund within 180 days from the date of purchase. Simply send them an email or call their Customer Support Team to ask for a refund if needed. For instance, Bacopa monnieri might cause diarrhea, nausea, fatigue, dry mouth, and stomach cramps. You may experience insomnia and/or stomach upset if you take more than 300 mg of phosphatidylserine. As we always suggest, make sure to follow the recommendations of the manufacturer for taking this supplement. This might not work on people who have severe memory problems or are already in the advanced stages of any memory-related diseases, such as Alzheimer’s disease. Get professional medical help if you suspect you have persistent and/or extreme forgetfulness to get the right diagnosis and treatments. These are disappointing news for people outside of the U.S. The good news for US residents is that the shipping is free and will take only 2 to 3 business days. Does the “Solomon’s Secret” deserve your money? We can’t give a definite answer to that. However, we believe it’s worth a try. Fortunately, it comes with a 180-day, money-back guarantee, so you can see for yourself if it will help improve your memory, brain function, and overall health. It’s hard to say how effective it is because Glenn didn’t provide data about the efficacy rate of this supplement. It might work on people with normal forgetfulness and early-stage dementia (if caused by alcohol, drugs, depression, hormone imbalance, or vitamin deficiency). Students and people who have jobs that require excellent memory, concentration, and cognitive abilities might benefit from this, too. For severe memory impairment caused by trauma or degenerative disease, this supplement would not be able to reverse it. Overall, we can say that if you have severe memory impairment, if you have a progressive brain disorder or memory-related disease (such as Alzheimer’s), or if you’re allergic to any of the ingredients used in this supplement, the “Solomon’s Secret” might not be for you and it is highly recommended to consult your doctor in such case. On the other hand, if your condition is not severe, if you want to enhance your short- and long-term memory, if you want to boost your energy and cognitive abilities, or if you simply want to reduce your risk of dementia, the “Solomon’s Secret” dietary supplement is a great option to consider. Well, that’s it for this review of the “Solomon’s Secret” by Olympus Wellness. We hope we provided you with enough information. If you have already tried this memory-boosting supplement, please let us know what you think by leaving your comment below. Click Here To Check All The Discounted Packages Available For The Solomon’s Secret Supplement! « What Health Conditions Cause Joint Pain Symptoms?